Website Updated! New Calendar launched! Believe it or not the website has been updated and a site specific calendar has been launched. This calendar is fully customizable for our own events and reminders. If you have anything you would like to put on there then please feel free to try it out. Use the link on left side of the page to navigate to it. Also, a reach out to anyone out there familiar with web design that would like to help with the site; I would like to get a new (and much needed updated) puppies page launched and could use some help from someone with experience. I also have quite a few behind the scenes fixes that need tending to which I could use some assistance with. Please inquire to admin@guidedogpuppies.com if you are interested! A belated congratulations to Spud and his raisers! Spud graduated as a working guide dog last month! This past weekend, on Saturday, December 11th, Launcher, a male yellow lab graduated as a working guide! Congratulations to Launcher and his raisers! Great job!! Since the Excursions & News page has last been updated, the Contra Costa East Guide Dog Raisers are pleased to announce two more graduations! 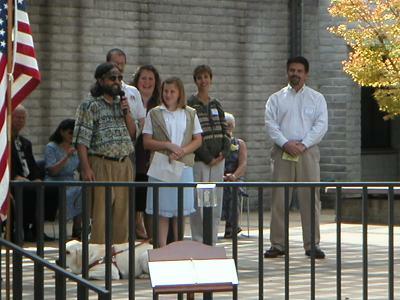 Felicity, a Female Yellow Lab, graduated as a breeder. Congratulations to Felicity and her raisers! Fennel, a Female Yellow Lab, graduated as a guide and is now working in southern California. Congratulations to Fennel and her raisers! Below are pictures from Fennel's graduation. If you have any pictures of Felicity's graduation please e-mail them to neil@guidedogpuppies.com and they will be posted here. On Wednesday, April 21st the Contra Costa East Guide Dog Raisers all rode the city bus with their dogs by their sides for our monthly community outing. Tri Delta Transit generously provided us free bus use for the night. Below are pictures and a small caption that appeared in the Contra Costa Times Newspaper on Friday, April 23rd. Armstrong & Huette Get New Careers! 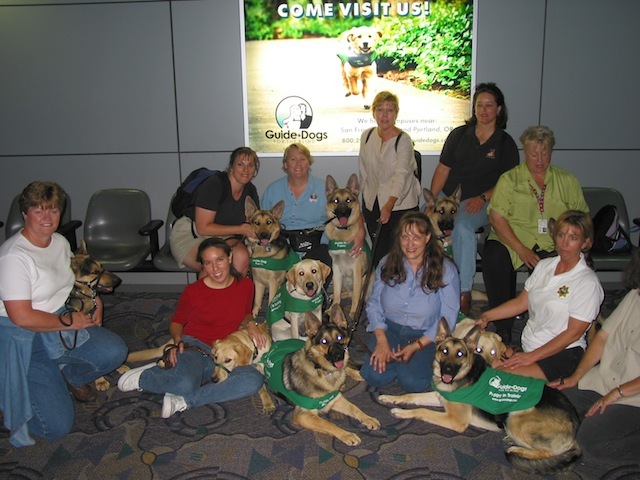 The Contra Costa East Guide Dog Raisers are pleased to announce that two of our career changed dogs have found new careers! Armstrong, a male yellow lab is being trained by Mark to become a Diabetic Detection Dog. Huette, a female yellow lab is being trained by Neil to become a Search and Rescue Dog. Below is a picture of both Armstrong and Huette together. Huette is on the left and Armstrong on the right. Congratulations to both of them for finding their new careers! Peabody graduated as a working guide yesterday at the San Rafael Guide Dog campus. Congratulations to Peabody and his raisers! 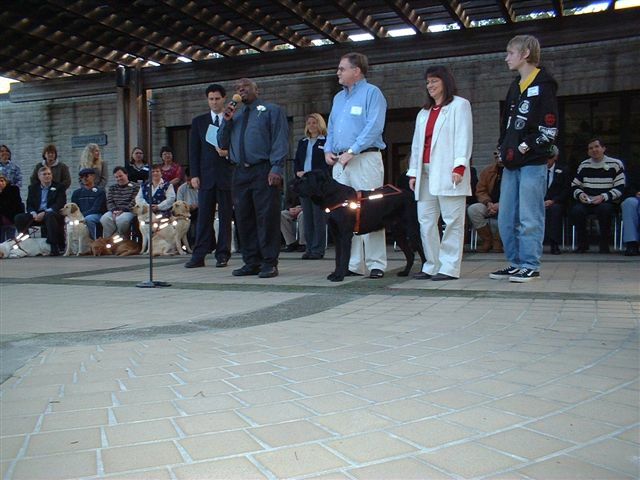 Below are a couple pictures that were taken at graduation of the raiser family with Chris, and his new partner Peabody. 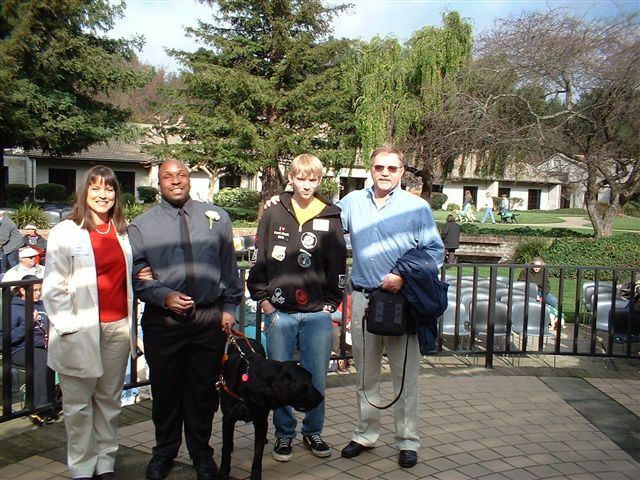 The Contra Costa East Guide Dog Raisers are pleased to announce that Jimbo, a black lab male, graduated in December! Congratulations to Jimbo and his raisers! Below are two scanned images of an article that appeared in the Contra Costa Times newspaper in which they focused on Jimbo graduating. Just click on the images to see the full size article. Phil graduated at the San Rafael Guide Dog campus today and is now a working guide. His raiser family flew down from Vancouver, Washington to attend the graduation. It was clear that everyone from the puppy raising group enjoyed seeing them again. Congratulations to Phil and his raisers! Below is a picture taken at the graduation. Phil is lying down like a well-behaved guide dog!